Wasabia japonica is a member of the Brassica family, which includes cabbages, horseradish and mustard. The prized rhizome varies from a very light to a darker green, often with a purple ring running through it. 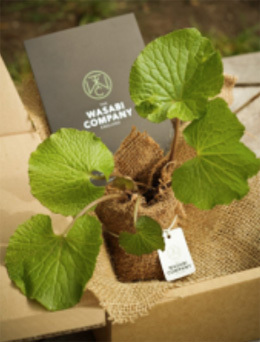 We’re growing and harvesting fresh wasabi in Britain, using traditional Japanese methods. Native to Japan and notoriously difficult to grow, we labour for two years over our wasabi crop to get it ready to grate and eat. That’s how long it takes to grow Sawa wasabi, the purest, sweetest, hottest and healthiest wasabi. Sawa refers to the flowing water that wasabi likes best, accustomed as it has become over centuries, to growing beside cool mountain streams. We harvest crops every week and new batches of fresh wasabi are available at the start of each week. This is when we update our website so it always lists availability of a variety of sizes. 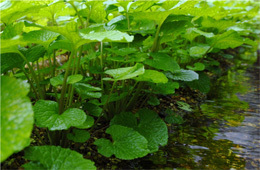 Also called Japanese Horseradish wasabi is not a member of the horseradish species. Archaeological evidence shows the ancient Japanese were eating wasabi as early as 14,000 B.C. By the 16th century cultivation had spread, but use was restricted to the Japanese ruling class. Production increased with the rise in popularity of sushi, when wasabi became the preferred flavouring and was prized for its ability to counteract food poisoning. Wasabi has a uniquely sweet taste and fiery heat which really wakes up the taste buds and sinuses. Although it has traditionally been eaten with sushi, the flavour and pungency of wasabi has been recognised by many of the world ́s top chefs outside of Japan and it is now appearing on European menus combined with everything from Carpaccio of beef to ice cream. The heat of wasabi differs from chilli. It develops quickly and rises up the sinuses rather than holding in the mouth, then quickly dissipates. We think fresh wasabi has a very clean heat. You’ll see what we mean when you try it. Our own fresh wasabi has been sold to chefs in Europe’s best restaurants who have thrown out their wasabi pastes and powders in favour of the real thing. Our wasabi has impressed the best sushi chefs working in London and now you’re in on the secret. Pastes and powders purporting to be wasabi contain very little actual wasabi. Check the ingredients and you will see horseradish and mustard powders make up most of the ingredients and actual wasabi makes up just a few per cent. Some products masquerading as wasabi contain no real wasabi. Try the fresh and find out what you ́ve been missing. Just be aware that fresh wasabi is a beautiful pale green colour when grated and ready to eat. There’s nothing wrong with it because it isn’t lurid green, on the contrary, it’s just how nature intended it to be. It is very important you follow our simple instructions on how to prepare your fresh wasabi to ensure you get the very best flavour and to encourage the potential health benefits; see our how to prepare fresh wasabi page. Traditionally wasabi is prepared using a sharkskin grater or an oroshigane grater. 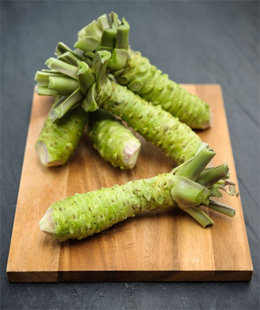 We have sourced authentic oroshigane graters from Japan that will enable you break down the cell walls inside the rhizome to instigate the chemical reaction between myrosinase enzymes and glucosinolates to form the all important isothiocyanates that provide wasabi’s unique pungent heat. It is these isothiocyanates (ITCs) that have led to wasabi’s ancient reputation as a healthy food. In fact anti-microbial, anti-bacterial and anti-parasitic qualities are very likely to be the source of wasabi cultivation in ancient Japanese societies. The diet often contained raw fish and wasabi was used to counter the effect of food poisoning. 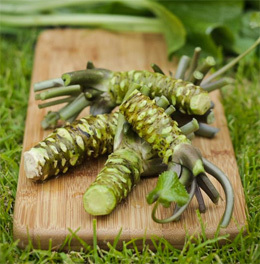 Along with those other famously healthy members of the brassica family that produce ITCs, broccoli and watercress, wasabi has recently become an important tool in research into cancer prevention and treatment.